St. Rose artist Nonney Oddlokken’s creative large-scale paper quilts will be on display at the Studio Waveland and Gallery, Coleman Ave., Waveland, Miss., through Oct. 30. St. Rose artist Nonney Oddlokken’s creative large-scale paper quilts will be on display at the Studio Waveland and Gallery, Coleman Ave., Waveland, Miss., through Oct. 30. The works are based on the retelling of Cajun Folklore and celebrating rural Louisiana entitled, “Tiny, Little Fables.” After spending over a half decade in Europe studying art and art history, traveling to just about every major art museums that Western Europe had to offer to look for inspiration, Oddlokken found her artistic voice, almost literally in her own backyard. Growing up in Mid City, New Orleans, which at the time, a working class neighborhood. 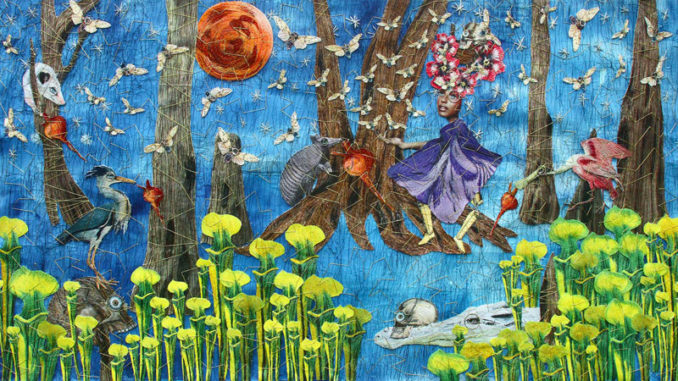 Oddlokken created her own genre in collage art by stitching many layers of handmade paper together, embroidered found imagery and to connect the elements and storytelling together, she uses yards of gold thread. In Red Moon Offering in Bayou Déjà Vu, (depicted above) she hand stitched 300 yards of gold thread into the art.